I was telling a friend about this recipe and she called it Faux Paella because it doesn’t have any rice in it. Faux Paella, Low-Carb Paella, call it whatever you want, it’s delicious. And healthy, too. Get all your ingredients together. Note the peas, herbs and stock are all from my microfarm/kitchen. This recipe was because I am in the process of cleaning out my freezers and pantry and larder. So this used up some of the things so I could clean and get things ready for the next growing season. I keep forgetting to note how many stars these recipes have — each star representing something that I grew and used in the recipe. This one is tough. Some of the herbs in the dressing were from my microfarm. And the peas were from our last harvest. But that’s it. However, I also made the stock. So this does get a three-star rating. You will need a balsamic dressing for this. Be sure that it is just oil, balsamic, and herbs — no sugar, please. Fortunately, you can get it already made, but it’s super easy to make your own. Just two parts oil and one part balsamic vinegar and your choice of herbs. I prefer parsley, chives, and basil in mine. But you do you. 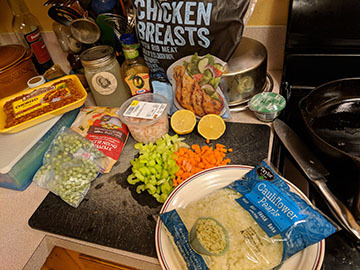 The recipe calls for chicken thighs, but as I mentioned above, I was cleaning out the freezer/fridge/pantry. So, you’ll see in the photos I used chicken breast because that’s what I had on hand. With breast you’ll use more stock then with thighs, hence why the recipe calls for one to three cups of stock. Even if you don’t use all three cups while preparing, it’s nice to add a little stock to leftover container to keep the paella moist. This recipe calls for shrimp. In a pinch you could skip this ingredient, especially if you’re planning to eat for breakfast or lunch the next day. Some people are not happy with a fried egg over the paella with shrimp in it at breakfast, but I think it’s delicious. Plus, traditionally, paella is going to have some kind of seafood in it. I had the small cocktail shrimp on hand that I needed to use. 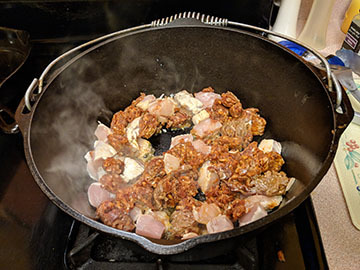 The cooking the chicken and chorizo step. Don’t skip the saffron. I know, it’s a spendy ingredient. 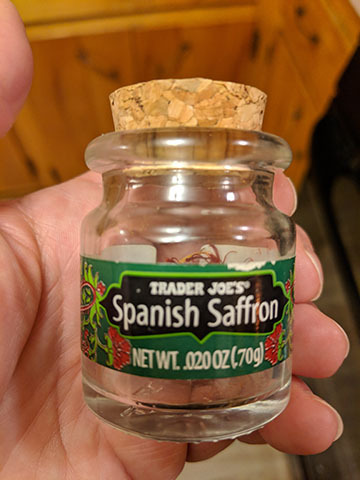 But Trader Joe’s provides an inexpensive and quality saffron for home cooks. No, TJ’s isn’t sponsoring me. Just a tip from me to you. Set the chicken and chorizo aside after the initial cooking. Don’t worry, it won’t necessarily be cooked through. That will happen before the recipe is done. In your cast-iron dutch oven, heat 2 tablespoons oil over medium-high heat. Add chicken and chorizo and brown on all sides for 3 to 4 minutes. The meat will not be cooked through. This is fine. This is a pre-seasoning of the pan and the a searing of the meat step. 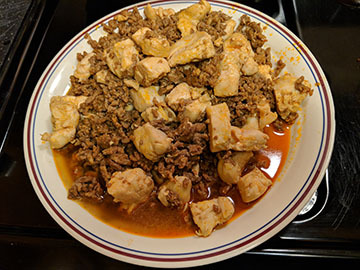 Remove chicken and chorizo from pan and set aside. 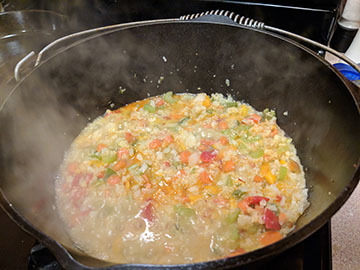 Heat remaining oil in pan and add onion, carrot, celery, and bell pepper. Cook for 3 to 5 minutes until vegetables are translucent. Season with salt and pepper. Add cauliflower rice to the pan and stir to coat. Add saffron and stir. Cauldron Cooking at it’s best. 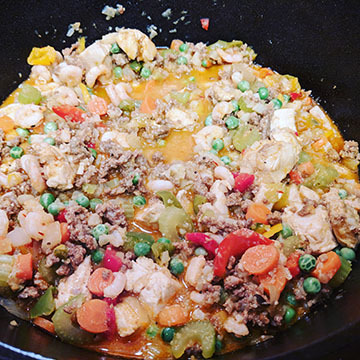 Finally stir before adding chicken, chorizo, and shrimp back to the pan, carefully nestling the pieces within the vegetables and cauliflower “rice”. Cover dutch oven again and continue cooking another 10 minutes until meat is cooked through and cauliflower “rice” is al dente. Top with peas and parsley. Stir. Drizzle with dressing and lemon juice. Serve immediately.